For those who have overdone the festive food a little, it could be a quick and relatively painless way to get rid of the unwanted pounds. Research has shown how dieters can trim two inches from their waistlines in only eight weeks by increasing the proportion of protein they eat and cutting back on carbohydrates and fat. The independent study was carried out by scientists for Marks & Spencer to investigate the claims of its Simply Fuller Longer range of ready meals and snacks. In the trial, the group of men and women followed a menu planner that combined healthy, high-protein breakfast options with items from the range. 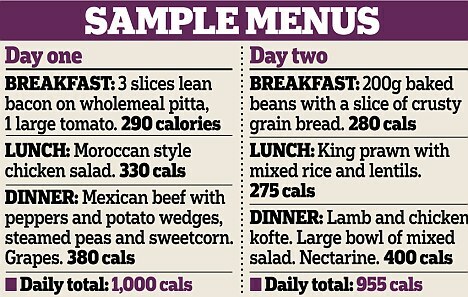 Over a four-week period, 45 volunteers, who were restricted to 1,000 calories a day, lost on average 10lb 7oz (4.7kg). But an extended study carried out over eight weeks found that 12 of the overweight participants lost on average 14lb 5oz (6.5kg) on the diet. Their waistlines shrank on average by two inches to 37in (94cm), their average body fat fell from 36.8 per cent to 34 per cent, and cholesterol levels dropped by as much as an eighth. The menus feature snacks and ready meals including Asian-style Lochmuir salmon salad and chargrilled chicken and tomato risotto, with high levels of protein provided by fish and lean meat.Nutritionists say that a diet containing a high proportion of healthy protein-rich foods can aid weight loss because they create a feeling of fullness faster than those containing carbohydrates or fat. The study – by scientists at the Rowett Institute of Nutrition and Health at Aberdeen University – found that the volunteers felt less hungry despite cutting their calorie intake by 40 per cent. Senior research fellow Dr Alex Johnstone recommends sticking to the protein-rich diet only as long as it takes to achieve the desired weight loss, then trying to maintain it through exercise.